A 750$ bug :P Lets get started. If the integer value used is less than the minimum signed or unsigned int. This is called an underflow and will also trigger a segmentation fault. Before this change, if the metadata for a dbm-format certificate (or presumably key) database were corrupted, ugly_split could do an unchecked subtraction resulting in unsigned integer underflow, and would attempt to operate on something it thought was very big, resulting in (at least) an out-of-bounds. Okay, it was causing a crash while adding certificate which gave me an hint that this bug will come under crypto-core-security in Firefox. Moving forward i report this to Mozilla. However i noticed that if i create a new profile in FirefoxESR (i.e. go to "about:profiles", "create new profile"/"launch profile in new browser") and add the same certificate it didn't cause a crash. So it seems like there's something specific to my profile that's causing this underflow, Moving further David Keeler and me analyze cert8.db file to check for the root cause of this bug. Where cert8.db file consists of security certificates stored separately from the Operating System. sometimes the certificate store can become corrupted. 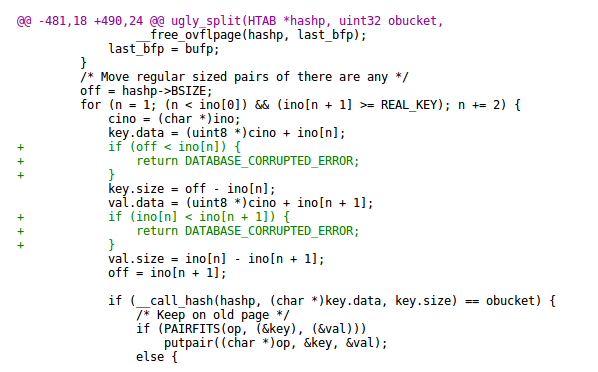 At A, we have no guarantee that off >= ino[n], so at B we pass in a very large value for the size of the key. Mozilla Security Team change risk from None to Moderate (sec-moderate) based on that this would require modifying the user's profile on-disk to exploit. PS: I tried exploiting this using ncat with SSL but the session is not stable and it dies. For everyone who might need a better understanding of how this bug works and how it can be exploited, read further. As stated in the blog, a corruption in cert8.db causes this crash, and every beginner in BOF knows crash is how we fuzz to create an exploit. Since there is no check in the value of the variable 'off' any overwrite can make the value of 'off' to be set lower than ino[n] resulting in the crash. Assuming 'hashp' is a pointer to a buffer size or memory address, a lower or negative value of 'off' may be result of getting higher memory address value from the stack thus setting key.size to much greater and when you have crashes and deals with memory there is high chances that this can be taken advantage to inject shell code into memory to execute. For now what I tired was adding a shell code in h_page.c with a handler but established connection was not stable, I am sure a more experienced exploit writer can get a reverse shell by overwriting the cert8.db. But how come it didn't crash with new profiles ?